Often we want to analyze trading performance not just as a snapshot, but over time – to see if we are improving, see if a particular strategy is working better/worse, etc. And while we can look at a cumulative P&L to see part of this, that doesn’t always tell the whole story. From looking at this chart, we can see a pronounced downturn around 10/2010, and we can use this information to help us drill down and understand what’s actually happening. n trade moving average – this shows a moving average over the last n trades; the x axis will be the index into the list of trades being shown, sorted by open date/time. 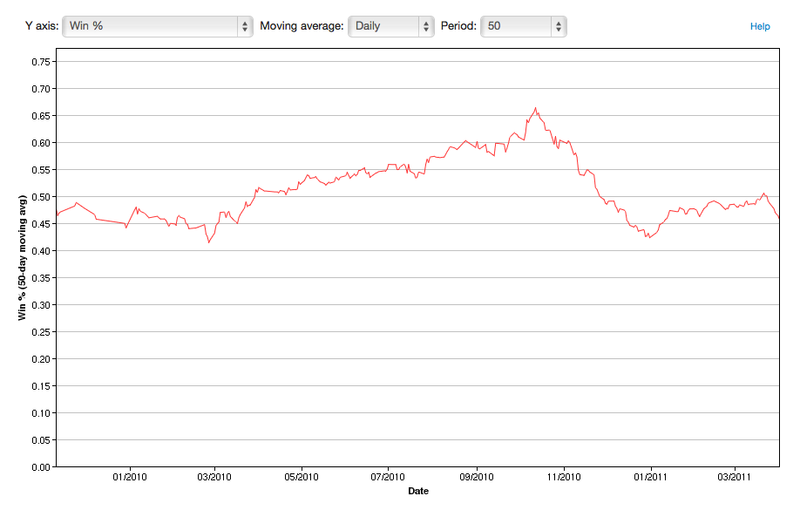 n day moving average – this shows a weighted moving average of the per-trade P&L over the last n days. This is not an average of the daily P&L, but rather an average of the per-trade P&L. As with all of the other reports in Tradervue, you can narrow the trade data used for the chart by using the trade filter. So, for example, you could look at the win percentage over time for one particular strategy (using tags), or just one particular symbol, or anything else you’d like to filter on. For additional information on the trend reports, refer to their help page. And if there are other statistics you’d like to be able to view on these charts, let us know! These new reports are available today for all silver and gold subscribers. Let us know if there are other columns you’d like to see in the Trades View! We recommend using Chrome, Firefox, or Safari for best results when printing. If there are other columns you’d like to see in the Trades View, let us know!